We meditate sitting on chairs to ensure that everyone is comfortable. There is no physical exercise involved. The rooms are modern, well lit and in an established community building. After welcoming everyone, the meditation Teacher introduces the subject of the evening and then guides a simple relaxation meditation. This usually involves focusing on the breath and letting all your worries and troubles slip away for a while. The meditation Teacher will give a brief explanation of a Buddhist topic which is of practical benefit to our daily life. Then the Teacher will lead another guided meditation, this time focusing on the meaning of the talk. Afterward there is an opportunity for informal discussion to ask questions of the Teacher and clarify any issues that may have arisen. After the class you can usually talk with the Teacher, the assistant and other students directly. People from all walks of life attend the classes—young and old, religious and non-religious. 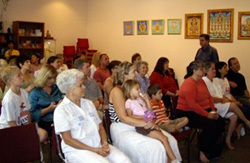 Some simply want to learn how to meditate, others want to find out more about Buddhism; the classes cater for both. Meditation classes are evening based and no pre-booking is required. There is no need for any special attire. You may sit in a chair or on a cushion, so just wear whatever is comfortable for sitting. As a courtesy to others, please avoid wearing strong perfumes or other scents, and ensure that your cellphone is silenced before class begins. Nothing is required, though many people like to bring a pen and paper to take notes. Come by early for a guided tour at 9:30 am, learn all about their programs and events and find out about how to get involved in the community.